This guest post comes from Ashley Mae Christensen. To see more of her lovely work and read about her the project, go to her blog where this poster can also be purchased. It is easy to believe you are small, even insignificant in the world. I’ve done a fair share of wondering in the deepest parts of my heart, where I had assumed there was simply no one else around those places to whisper a good word to my doubts and fears. I live in a quiet place. Some days, I only talk to 10-month old son, Remy, the three nine-year old boys in my courtyard, and my husband when he gets home from school. But in my heart, women I hadn’t known until now are slowly filing into those deep places. They are my friends, better yet, my advocates. They seem to nod to me, tell me to keep going, to work hard, to speak up, that I am good, even better than I think I am. We even celebrate together. I met these women one at a time. I am getting to know them through their words. Some through stories told by others, some typed out in books they’ve composed, and others in speeches spoken in front of many people. I was inspired to take up this project after I had painted a similar series of the Twelve Apostles and the First Presidency of the church. I didn’t feel right about offering a painting of fifteen men for people to put in their homes without a companion of equally influential and important women to put up alongside it. I felt like the men in the first painting would agree with me. As the idea for the Mormon women artwork formed I realized that there really wasn’t any resource or visual gathering of these women. It made me sad to think that in many Mormon households there are prominent photos and paintings of Mormon men, but rarely are we exposed to Mormon women. I thought a lot about myself as a youth, and even now, as a young mother in a new city, I wondered which women I could invite into my own life and hopefully the lives of others to bless, uplift and inspire. I’ve found a new resolution to love myself while still expecting much of myself while reading the words of Chieko Okazaki; proof that our writing does make of difference through the example of Emmeline B. Wells; courage to make art about my religious convictions through Minerva Teichert; more reason to stick up for what I believe in through Esther Peterson; peace in working hard and moving forward the best way I know how through Laurel Thatcher Ulrich. I want the stories, the words, the faces of Mormon women to be in our lives. I realize that the images on this work are by no means comprehensive. I want our Young Women to learn about these women at Wednesday night activities and camp, I want Remy to respect and love them and then in turn, I want us to love ourselves more because we know about them. I want these women to continue to teach me daily so I can better know how to teach others around me. I don’t want this artwork to simply be a tribute to these women, although it is partially that. I want this artwork to celebrate that within the gospel there is a place for women who do grand and public things, but there is also a place for women who do equally important work that is quiet and may never be known publicly. I want the artwork to inspire Mormon women to be better, but also to realize that they are already probably better than they think they are. I want us to be able to celebrate collective accomplishments, both large and small. Perhaps the most important part of the painting is the space left to insert your own photograph. I want the stories, the words, the faces of Mormon women to be in our lives. I realize that the images on this work are by no means comprehensive. I want our Young Women to learn about these women at Wednesday night activities and camp, I want Remy to respect and love them. I want these women to continue to teach me daily. This is why I am doing this project. I love it. I think it is so important to teach everyone about important women in history. I always tell my kids they need to do projects on women for their school projects because they need to know their stories and so does everyone else. My girls love the temple pictures you painted. I love them too. I will have to get one of the posters. This is lovely, Ashley Mae! How exciting would it be to see a poster like this in the Young Women’s or Relief Society rooms? I can’t help but compare this poster to the fold outs of General Authorities in the Ensign. I love that these women all look different even without their faces. If we took the faces off the GA poster, it would probably look like a bunch of the same suit and tie in varying shades. This is beautiful. For myself as a woman and as a mother and grandmother of daughters and granddaughters, I thank you. A few months ago I happened to walk into one of the seminary rooms in a neighboring ward building. The walls were covered with pictures and posters and reading charts. Though there were several girls’ names on the charts, all of the photographs in the room were of men (in almost identical suits) and all of the characters in the scripture-based artwork were men as well. The lack of female images was so striking, it took my breath away and brought me to instant tears. I have a poster of the past Relief Society presidents in my home office; it is older– as in before Beck. I have looked for a newer one with Beck in it, but I can’t find one– I suspect that one hasn’t been made. 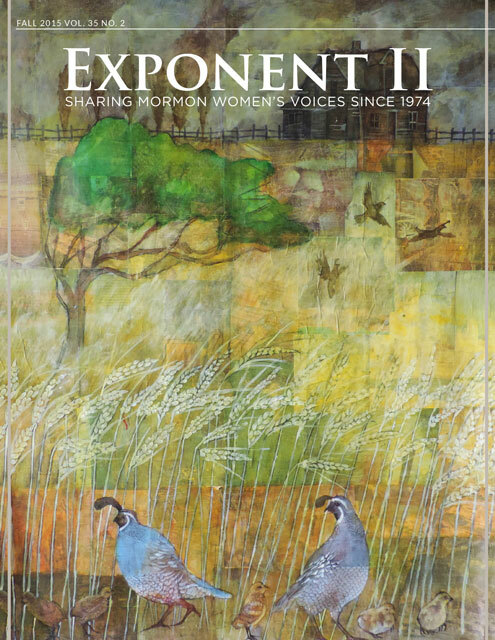 I agree that there are many more images of males in church art and church media, –and perhaps that is why my home is largely void of Mormon art– but the art I have is of Mormon women and Christ. I don’t have the typical 15-man poster anywhere. There are some choices for women’s art– though not many. I am picky too, because I don’t like images of women with children (unless it is the Madonna and child), which is seems to be the most common female church image out there. I think that political issues (mostly pre 2000) with Emma resulted in her and many of the pioneer women out of art, as Emma’s branding was that of beaing heathen for not going west, etc., Perhaps celebratory and commemoration art of the Relief Society was dissuaded (systematically or psychologically) because of this narrow and false perception of the first General Relief Society president. With that, and embracing the depth of history of women in the church, it would be liberating to have more art that depicts women of the church, as your work does, Ashley Mae. Art is personal and inspires the spirit, so I think that to have choices that invoke spiritual womanhood (not limited to motherhood) would do well to harbour a spirit of overall divinity within one’s personal space. Spunky, sounds like we have similar taste in female art. I’m also not drawn to pictures of women with children. Have you read She Who Is by Elizabeth Johnson? There’s a photo of a woman hand spinning thread. It’s used as a description of God; I’m going to butcher it if I try to explain it, but it hit me so hard to see a woman working alone as an image of God. She was set up as a symbol of divinity, not her motherhood, but her. That sounds amazing! I’ll have to check it out. Thanks!! I dislike how prevalent mother-with-child is in church art depicting women, too. P and I frequently go for walks down to temple square and it’s hard to find many artistic depictions of women there *without* children. I suppose the mother-with-child theme would not bother me as much if it were one among many themes, but it’s not; it’s by far the most dominant theme. No surprise, really, given that woman-as-mother is essentially the only narrative the church provides for women. Me too. I like mother and child art, but that is pretty much the limit of it in Mormon art. I think visiting teaching art– companionships of women helping men and women (and children), or pioneer women and hand carts and similar would help me to feel less lonely. I mean, even women with children feel lonely- and are alone … it would be nice if that sense of womanhood and women being comforted by the spirit (rather than directed by the spirit about children) was represented. I just skimmed through your work, and I love it. The flower pictures especially spoke to me, and the colorful elephants. Such beautiful work! Ashley Mae, thanks so much for painting this — I just ordered the large poster from Etsy. It definitely belongs in my home, and I loathe most Mormon art. I’m going to have a big fight with myself over whether it belongs in my office space or in the bedroom my daughters share. Love your work, Ashley May! 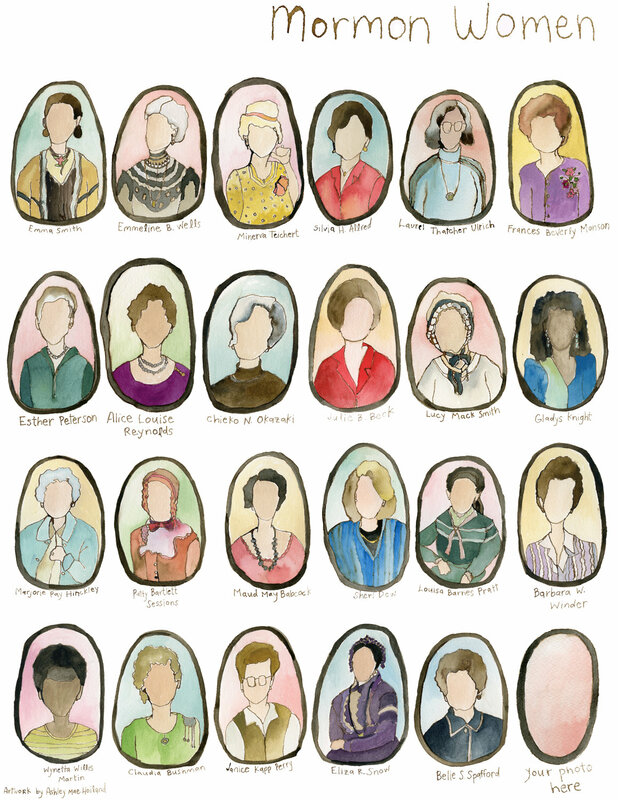 And I love that your poster depicts not only the traditional female leaders (RS presidents), but also other women who have made major contributions in various capacities. Even more, I love the philosophy behind your project–this idea of collective strength as various women have, through their words and stories, helped you recognize your own goodness even as you strive to be better. That’s a lesson I often need to re-learn and I love the idea of a visual reminder of the kind of community that so richly informs both Mormonism and women’s lives more widely. Wow, this is just gorgeous. I have to admit, I have never felt much of a kinship with (or interest in :/) Mormon women until recently… Maybe evidence of how much we neglect them in our faith? In my Molly Mormon years I felt a deep love for Joseph and Hyrum, and for President Hinckley and some of the other current General Authorities, but never the women… And I’m even descended from Emma. Wow, I’m depressing myself with how horrible I am. The moral of the story here is that even with my abominable sort-of-apathy, your post really struck me, Ashley Mae. Seriously… I’m about to go read it again. Thank you.